The recurring theme at the convention was storytelling — how to create deeper connections through personal, authentic stories of your organization, your artists and your work. The arts are ripe with these vibrant narratives, and yet many organizations still seem to struggle with making their stories resonate. Pittsburgh is a great example of a city that has been truly reinvigorated by the arts; thanks to AFTA and the Greater Pittsburgh Arts Council , conference attendees had the opportunity to really dig in and get to know Pittsburgh’s impressive cultural scene, from performances at keynote lunches (my favorite was Balafon West African Dance Ensemble ) and an opening party at the Andy Warhol Museum , to “ARTventure Tours” that explored various cultural hot spots around the city. 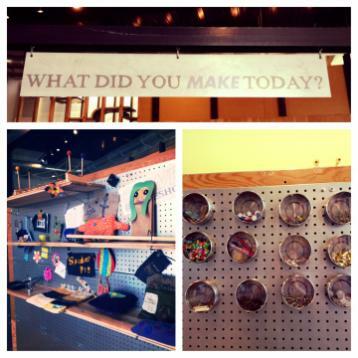 I decided to take the “Green Arts Spaces and Initiatives” tour, and I’m so glad I did! We had a wonderfully knowledgeable tour guide, Jen Saffron of the Greater Pittsburgh Arts Council, who really gave us an insider’s view of the city. Our tour started at the Children’s Museum of Pittsburgh . I was so charmed by this museum and its commitment to creating a space for children to explore and create in the art studio and the “make shop,” as well as be inspired by the work of local artists. Even without my 5-year-old along for the trip, I could have stayed here all day. (Perhaps I’m still a kid at heart!) The museum’s deputy director told us about some of the green features that brought them a Silver LEED certification , including using renewable energy and local and sustainable materials, and how they repurposed spaces like a former planetarium. Next up was the Phipps Conservatory , which reminded me of our area’s Longwood Gardens. Phipps has a new Center for Sustainable Landscapes that has been designed to meet or exceed the world’s three highest green standards. The chance to wander through the greenhouses, enjoying the flowers, the butterfly garden and the incredible art glass installations (including several Dale Chihuly pieces), was calming and rejuvenating. Next, we got an up-close-and-personal look at glass making at the Pittsburgh Glass Center in the city’s East End neighborhood, an area being redeveloped with the arts as a foundation. Something I didn’t know about Pittsburgh is that glass was a major industry along with steel. PGC is another green building with a heat recovery system for those extremely hot furnaces. Our groups was invited to watch an artist at work as he pulled hot glass out of the furnaces, added color and shaped it. I had never seen this process before, and it seemed like hot, dangerous and difficult work. We also talked with a gentleman who was blowing small glass decorative balls in a smaller studio space. He had been a scientific glass blower for decades and now uses the PGC space for his work. You really understand what you’re paying for in a handmade glass object when you see how it’s done. After an inspiring but long afternoon, we were all getting pretty hungry, so it was especially a treat to end our day at LOCUS where we were greeted with a plethora of locally sourced food and sangria. LOCUS is a small gallery space showcasing eco-focused art. I had a chance to speak with an artist who had created a piece inspired by the movement of bees and the colors of honey and buy a handmade cookbook. These are excellent examples of firsthand visitor experiences that tell the stories of art making, of artists’ passions and of organizations’ missions in ways that create lasting connections to the work. Although this tour was a small group experience, organizations can learn from the more intimate experiences and scale them up. I’m inspired to bring what I learned back to Philly and to continue telling the stories of our cultural scene and our amazing clients! Thank you for coming to Pittsburgh! Submitted by Ashley Paulisick (not verified) on Mon, 07/08/2013 - 8:16pm. What a wonderful recap of your experience in Pittsburgh. Thank you for sharing the many details. There's much more to see than what you can fit in in a day, so bring your 5 year old with you for a longer stay. Thanks again for being a part of the convention. Submitted by megan on Thu, 08/08/2013 - 12:23pm. Thanks, Ashley! I definitely plan to come back with my family. Had a great time.